Any organization, any segment and any geography – any employee who is productively and creatively engaged are sure to work wonders as compared to those who are not. With an enterprise having actively engaged employees, the customer loyalty quotient is much higher and chances of garnering more business are also on a higher ratio.In a similar fashion, a low lying employee engagement ratio may lead to a poor customer retention quotient. Hence, the crux of a successful business lies in, undoubtedly, keeping your employees happy, engaged and empowered. And, when we talk of a technology that not only empowers, it engages, entices and enriches – it is none other than our very own mobile-based technology that has already penetrated deep into our lives, almost stuck to our day and night. 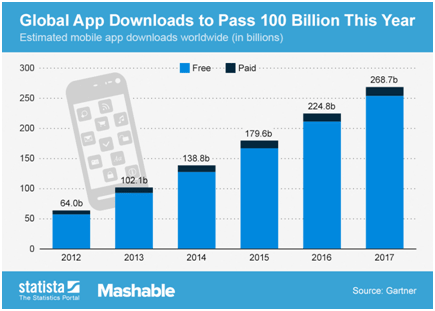 A worthy mobile app experience can entice and engage its users. Employees, today, are in search of access to real-time, instant and detailed information, at one go through Enterprise Mobility Solutions. With the BYOD concept making waves, each employee is already glued to their mobile devices. Engaging the employees in a positive way, such that they contribute in the best optimal way to business, is the right thing to do. The globe is moving not only towards a customer-driven approach, it is employee driven first. A happy employee makes a big way for a happy customer. With the state-of-the-art technologies coming in, IOT driven enterprise mobility solutions have been powering productivity and profitability. How can Enterprise Mobility Solutions Enhance Employee Engagement? Today, it is a known fact that most of the internet is used for mobile apps rather than web browsers. For e.g., Beacons in Enterprise Mobility has been revolutionizing and boosting business big time. Hence, in order to keep the employee motivated and engaged, it is always a good idea to have all those important functionalities under their purview, embedded into the mobile device they are using. This makes the employee feel more special, wanted, responsible, technology-driven, satisfied and happy. With the power of connected devices, employees are now themselves mobile and more creative and fast in their work, since they no longer, have to be stuck to their chairs. With everything lying on their mobile device, they feel all the more reachable and confident in their actions. 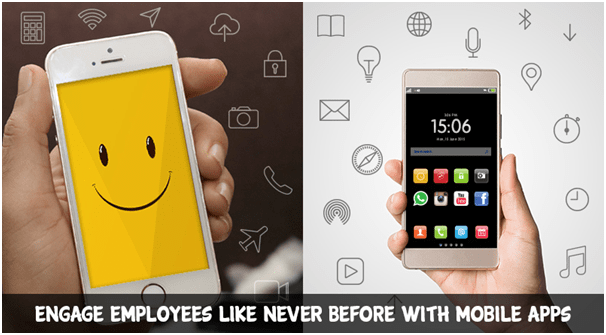 Here are some of the key highlights that emphasize that mobile apps are a table turner for employees and thereby, for organizations. The flexibility offered by enterprise mobile app development gives a big thrust to employees, being able to access work from anywhere at any time. This makes their connected area a small place, with the mobile devices connecting internally to other employees, to customers, to stakeholders, to top management and more. Of course, there are certain challenges to face but on the whole, it is a big treat for the employees as it eases out operations to a large extent. With enterprise mobility solutions, comes flexibility. With flexibility, increases creativity and empowerment. With that comes the sense of responsibility and ownership which directly motivates the employees to offer higher quality work and value added attributes like timeliness, discipline, hard work and more. Employees will becomes self-motivated and self-sufficient to find out ways and means to get their tasks done, engage more customers, garner great business and thereby, take the organization to a different level all together. With employees getting mobile savvy, more confident and responsible, gone are those days when employees always felt reluctant to share information with peers or seniors. Now, they are more than willing to share information and learn more about the power of being connected through the solutions on the mobile devices. Increasing training sessions, up gradation of knowledge, the spread of work allocation etc. makes the employee increase the working bandwidth, leading to self-growth and thereby the organizational growth too. Indeed, the world has become small after invent of the mobile devices. Employees are so well connected with each other that they don’t need any particular forum or time to discuss with each other. They are continuously in touch with each other and now with modern apps designed especially for enterprises, they are able to instantly communicate instead of emails earlier that took some time to reach. Employees within the office, on tours, at remote locations, at customer sites – wherever they are, they are just a fingertip away. Doesn’t this sound like the magic wave of technology! As a leading enterprise Mobility Solution Provider in India, our skilled software resources have been implementing multiple Enterprise Mobility Solutions with a multifaceted range of services, in vivid technologies that can give your organization the best of business efficiency and effectiveness. Our comprehensive, innovative and robust solutions have been successfully implemented across a wide range of enterprise clientele, all around the globe. Visit us @ https://www.spec-india.com/services/enterprise-mobile-app-development/to request for a Free POC to test drive our enterprise mobile app development services.